Located in Grandville, Andiamos Pizza is a purveyor of authentic Italian recipes ranging all the way from dinner to dessert. 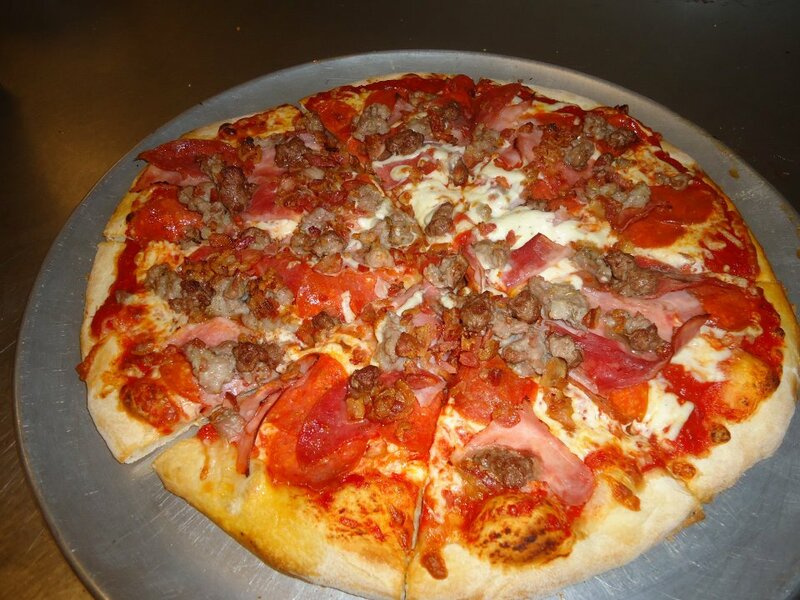 We offer several specialty pizzas, assorted crust styles (including Gluten Free and Califlouwer crusts) and a full menu of sandwiches, Stromboli's and Italian dinners. Our pizza and dinners are prepared fresh every time and the flavor speaks for itself. We know you will come back for wanting more! *Minimum delivery of $8 before tax and $2 delivery charge. Penne noodles tossed with marinara sauce and mozzarella cheese, then baked. Penne noodles tossed withe meat sauce, topped with ricotta and mozzarella, then baked. Baked pasta stuffed with cheese, meat, or combo with marinara sauce and mozzarella. Cheese-filled tortellini tossed with Alfredo and mozzarella, then baked. Cheese-filled tortellini sauteed with prosciutto ham, mushrooms, and garlic in a creamy marinara sauce. Fettuccine Noodles tossed in Alfredo sauce. Fettuccine noodles tossed with mushrooms, roasted red peppers, grilled chicken in a creamy Alfredo sauce. Penne noodles with sauteed fresh garlic, shrimp, zucchini, in Alfredo sauce with a sprinkle of romano cheese. Breaded chicken breast topped with marinara sauce, mozzarella cheese, and served with a side of pasta. Sauteed prosciutto ham, garlic, marinara sauce, and a touch of cream. Sausage, ham, broccoli, mushroom, mozzarella, and romano cheese. Ham, fresh tomato, roasted red pepper, artichokes, roasted garlic, mozzarella, and romano. Pepperoni, ham, onion, green peppers, mushroom, and sausage. Marinara sauce topped with romano cheese, sliced tomatoes, sausage, and oregano. Ham, pepperoni, sausage, bacon, salami, meatballs, and mozzarella. Alfredo sauce, pesto, diced tomato, grilled chicken breast, mozzarella, and romano cheese. Zucchini, broccoli, roasted red pepper, artichokes, mushrooms, onion, mozzarella, and romano cheese. Sweet Baby Ray's BBQ sauce, grilled chicken breast, onion, and mozzarella. Spicy marinara, pepperoni, sausage, mushroom, chicken, roasted garlic, and romano. Ham, pepperoni, mushroom, sausage, onion, green pepper, green olive, black olive, bacon, and broccoli. Light marinara, Cheddar, swiss, mozzarella, and romano cheese. Deluxe Stromboli: Ham, Pepperoni, onions, mushrooms, green pepper and sausage. Meatball: Sliced meatballs, mozzarella and marinara sauce. Crushed tortilla chips, taco meat, cheddar cheese, tomatoes, onions, and black olives served atop a bed of lettuce. Tomatoes, onions, mozzarella, roasted red peppers, zucchini, and chicken atop a bed of greens . Crisp romaine lettuce tossed with homemade Caesar dressing, topped with focaccia croutons. Our signature salad with tomatoes, onions, walnuts, pineapple and feta, served atop a bed of mixed greens. Hears of romaine, tomatoes, toasted red peppers, artichokes, onions and mozzarella.